Glass or metal fireplace doors block radiant heat but don't block air loss. Requiring glass doors for radiant heating fireplaces like Rumford fireplaces is counter productive. Glass doors block over 90% of the radiant heat while not preventing heated room air from escaping up the chimney - just the opposite of what most people expect. Glass doors will not transmit the THERMAL infrared wavelengths from 5 to 12 microns, although they may transmit the short wavelengths around 1 micron, which we do not feel as heat. The glass will heat up, however, due to its absorptance and then will radiate out with an equal emissivity and at wavelengths determined by its temperature and Planck's Law. In other words, glass is not transparent in the infrared. You get some heat from a fire through the glass only because the glass gets warm and re-radiates some heat. You'd get more heat through solid metal doors because metal conducts heat a little better than glass. According to the Stephan-Boltzman Law radiant heat is proportional to the fourth power of the absolute temperature. The radiant heat output of an open Rumford fireplace with a typical 1600 deg.F wood fire will be sixteen times the radiant heat output of the same fireplace with glass doors closed on the fire if the doors reach a temperature of 540 deg.F. Even very hot glass doors block well over 90% of the radiant heat. See the calculations. Besides blocking nearly all the heat, glass doors leak like a sieve - on purpose. Manufacturers almost universally provide glass doors with tempered glass rather than expensive high temperature neo-ceram glass. Room air is "washed" up the inside of the glass to keep it cool so it won't shatter. Closed down as far as possible, most doors still let in plenty of air so they don't cause the glass to break or the firebox to over heat and create a fire hazard. Glass doors, with all the vents closed, leak about as much as an open damper. They block most of the radiant heat but not any of the air - just the opposite of what most people expect. Valid criticism from another "expert"
Gasketed doors required by IEC? Well our 48" Rumford is complete (see attached JPG) and now my mason tells me he thinks maybe Thurston County, WA will require glass doors. Since they were not built into the masonry like your site shows is this a problem? Your Rumford looks great! May I use it on the website? The Washington Indoor Air Quality Code requires "Tightly fitting glass or metal doors, or flue draft induction fan or as approved for minimizing back-drafting." We've been successful at eliminating glass doors in western Washington by arguing that, if the space is designed to have positive indoor pressure (as are most commercial buildings, lots of high end homes and any home on the upper floors), then, in essence, we do have a "flue draft induction fan or as approved for minimizing back-drafting" - only our fan is in the mechanical room (or wherever) not at the top of the chimney. In Spokane, building officials will approve Rumfords without glass doors provided the house does not exceed 8 Pascals negative pressure (the limit on our guarantee). 1) Install a damper in the cold air return of your heating system so the air handling fan can be used to control the indoor pressure or install some sort of fan (like a kitchen fan) backwards to blow outside air in the house and argue that you have a "flue draft induction fan or as approved for minimizing back-drafting." 2) Appeal the decision to require doors based on the argument at the top of this page that fireplace doors are counter productive. 3) Make a cheap sheet metal cover since the code permits metal or glass doors and says nothing about hinges. 4) Install one of our glass or metal frameless aftermarket doors that are designed to be "visually minimal and easily removable". I have had a beautiful Rumford Fireplace built in my new home. I'm not moved in yet but could not resist having a few fires already! Because of building codes here in Washington State, I had to have glass doors installed. They seem to make all of the heat go straight up the chimney and negates the whole purpose of my Rumford. On occasion our office receives questions from code enforcement personal about the Washington State Ventilation and Indoor Air Quality Code requirements for fireplaces. My office does not agree with a number of the recommendations you're company has made for meeting this code. They are work arounds, not specifically noted in code. Interpreting these recommendations on an individual basis puts the code enforcement personal in an awkward position. Thank you. That's a good suggestion. Never mind that my "work arounds" have merely been passed on to me by customers, the responsible thing for me to do is to submit a code change proposal. Time is short but I will make an effort to submit a code change proposal by the Feb 28th deadline. Note: In short, I didn't have enough time to prepare a responsible code change proposal by the 2/28/06 deadline. I didn't want to propose something that had little chance of passing and for which I have done little groundwork. Re-reading Mr. Murray's email message, I asked him specifically what recommendations I have made that his office does not agree with and why. I hoped that maybe he and I could find agreement and together propose changes that would make the VIAQ code better. By the 28th he had not responded so any change I would propose will have to await another opportunity. In the meantime Section 402.3 of the Washington State Ventilation And Indoor Air Quality Code is pretty vague, the intent is not clear and it is at odds with the ICC codes. But it may be better to live with a vague and unenforceable code we can work around than to unintentionally help bring about a more rigid code with no room for interpretation. Are your "X" series doors the only ones that meet energy code requirements? We are constructing a 42" x 42" Rumford with one of your kits but under the IRC 2009 code we now have to make it ugly with some type of door or panel to meet code. Do you have any doors/panels that meet 2009 IRC code? The IEC requires "gasketed doors" I think. Problem is there are very few gasketed doors and very few doors that are anywhere close to air tight. That's by design so the bottled up heat that doesn't radiate through the door won't create a fire hazard. Doors basically leak as much as an open damper for cooling purposes - not efficiency. This hasn't been sorted out yet which is one good reason the local officials may not be enforcing the door rule. We do, however, have two air-tight gasketed doors. The Wilkening doors at http://www.rumford.com/store/doors.html#wk are very nice air tight doors with integral screens made by a company that makes big metal, masonry enclosed stoves and are not worried about any fire hazard. I think they are kind of heavy looking - and expensive - but the few customers who have bought them really like the quality. The other gasketed door we can offer is the Diamond W doors at http://www.rumford.com/store/doorDW.html Diamond W has figured out how to add gaskets to about any of their doors for about an additional $200. We are just in the process of expanding our website to promote these doors. I don't know if they will lead to any fires or not but I would be a little conservative on the code required wall thicknesses and clearances and I would not close the doors when burning wood in the fireplace. HPBA is proposing to have ICC remove the text from the IECC requiring fireplaces to have doors with gaskets through an emergency measure. They are trying to gather letters from different manufacturers and labs to support their position. In my conversation with Tom Stroud about this, he mentioned that there was a lab that burned down about 20 years ago when they attempted to reach equilibrium with a masonry fireplace. Do we have a position on this? Could we get letters from fireplace door manufacturers indicating that their doors would fail if they were required to comply with this? I agree, essentially, with the HPBA. In fact I testified against gasketed fireplace doors a couple of years ago when it was originally proposed but hadn't done my groundwork and was not persuasive. I don't agree with everything in the letters from Rick Curkeet and Darren Meyers but I do agree with their recommendations that tightly sealed doors on either masonry or factory-built fireplaces presents a significant safety hazard and should not be required especially since the damper can so much more easily be gasketed. On the face of it you might wonder why anyone would think that sealing the twelve foot perimeter of a typical fireplace door would be more effective than sealing the three foot perimeter of a damper valve. No one has mentioned it but it may be that many codes require dampers to be blocked open when gas logs are installed. That complicates the issue and I think the gas log manufacturers should come up with an alternative to blocking open the damper such as not permitting the gas to be turned on until the damper is open or, with a manual system, requiring a CO detector. I think this is a deliciously interesting issue. For years the door manufactures have allowed their customers and energy officials to think that closing a fireplace door on a dying fire at night will save energy by preventing heated air from being lost up the chimney when, in fact, all it does is block the radiant heat from the still hot firebrick and none of the air since the doors leak about as much as an open damper - for cooling, safely and liability reasons. See my yammer at http://www.rumford.com/tech14.html Now the fireplace door manufacturer must either admit that they knew all along that their doors block all the heat and none of the air OR they can put gaskets on the doors and see who gets sued first for causing fires. I love it. We might be able to get letters from fireplace door manufacturers but I don't think we need to. They are on the spot and cannot comply without causing a fire hazard and so are motivated even if, to some extent, they are cornered. You could start with the big two - Diamond W and Portland Willamette but I think they already are aware of the issue and are thinking up their best spin strategy. You asked about that lab fire while trying to take a masonry fireplace up to equilibrium. Rick's accounting of that is from a UL perspective. He's used to metal appliances that come up to equilibrium pretty fast. 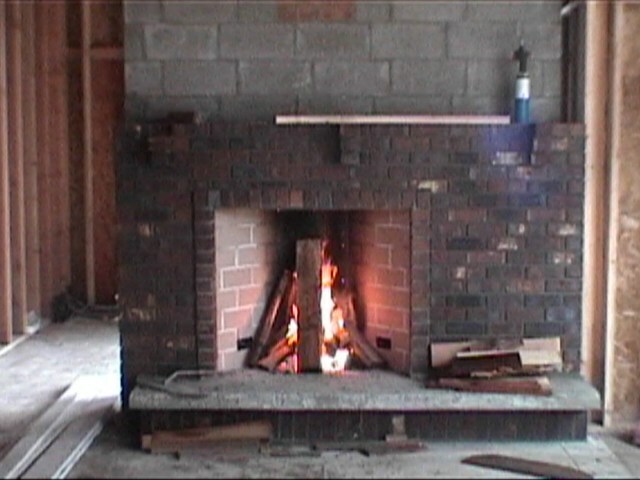 We ran into that a few years ago when we tested the BIA "minimalist" fireplace (I still can't call it a Rumford). We could not reach equilibrium and eventually the test failed (combustibles reached 90 degrees F above ambient) after about 9 hours on the 8" side and 13 hours on the 12" side. All that means is that masonry is not as good insulation as metal and fiberglass. It does not mean that a masonry fireplace is less safe than a zero - just that the test is written for insulated metal fireplaces. David Johnson, who did a lot of work with UL safety standards, noted that in the tests run in the 1960s to develop UL 907 (the standard for stoves inserted in masonry fireplaces - not just doors as Curkeet implies) they could never attain equilibrium and so none of the inserts would pass. They resolved the problem by testing the masonry fireplace until it failed and then tested the insert in the masonry fireplace. If the insert didn't fail before the "known to be safe" masonry fireplace, then it was judged to have passed. I don't think this negates Curkeet's argument as I think testing a masonry fireplace with doors would make it fail sooner than an open masonry fireplace, which is his point, but I liked the concept of masonry being the "known to be safe" condition. Modification: R402.4.2 (N1102.4.2) Fireplaces. New wood-burning fireplaces shall have tight fitting flue dampers or doors, and outdoor combustion air. When using tight-fitting doors on factory-built UL 127 fireplaces listed and labeled in accordance with UL 127, they must the doors shall be tested and listed for the fireplace. When using tight-fitting doors on masonry fireplaces, the doors shall be listed and labeled in accordance with UL 907. The proposal was then approved as modified and will be part of the 2015 Energy Code.